In AcclaimIP, you can either have the system create a matrix, or create one yourself from scratch. While having the system create a matrix for you is often a simpler option, it also allows you less flexibility if you are trying to adjust the matrix queries. In this first example, we will have the system create a matrix for us. I ran a query for CPC:g06f17 and the following are the results. Note: As applications are granted or removed, patents expire, etc. these results and the matrix will change. From the Search Results grid, run a matrix by going to Analyze>Concept Landscape Matrix. The matrix below is the result. Notice that the columns are blank. This is because we have not yet clicked Run Matrix. Note: If you want to keep the matrix around to reuse, make sure you save the matrix using the Save Matrix button in the top right. If you have not saved the matrix, there will be a reminder in red at the top of the window. Although the reminder will go away as soon as you've saved it once, if you make adjustments to the matrix that you want to keep, you have to save it again. The matrix is not saved automatically. 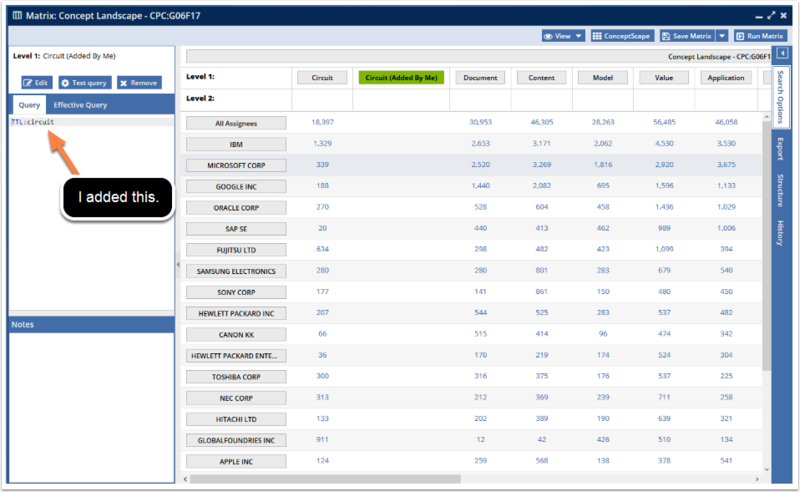 Once the matrix has been run, you will see the number of patents for each of the cross referenced queries. If you notice, the Level 1 term "Circuit" is highlighted in green. This means that the query in the panel to the left is what is being run for this particular term. 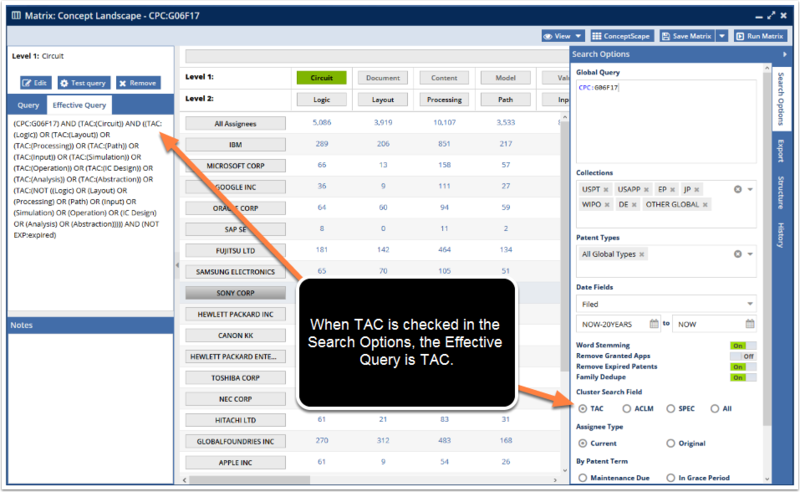 The simplest version is in the Query tab (such as "TAC:(Circuit)" in the Query tab above). When the system creates a matrix, it defaults to the TAC field code. To change this, click on the Search Options. As you can see from the image above, the Effective Query is much more complicated. Here, it includes the top level query (CPC:g06f17), the simple Query for the term itself (TAC:Circuit), and all of the lower level terms that are linked to Circuit. Notice that the lower level terms are linked by OR, where as the other query terms are linked by AND. This ensures that all of the patents that fall into the lower level terms are included in the higher level (i.e., the Level 1 term). Also notice that the Effective Query here also includes AND (NOT EXP:expired) at the end. This is because I have the Remove Expired Patents rule turned on in the Search Options. Notice that I changed the Cluster Search Field radio button in the Search Options panel to ACLM. 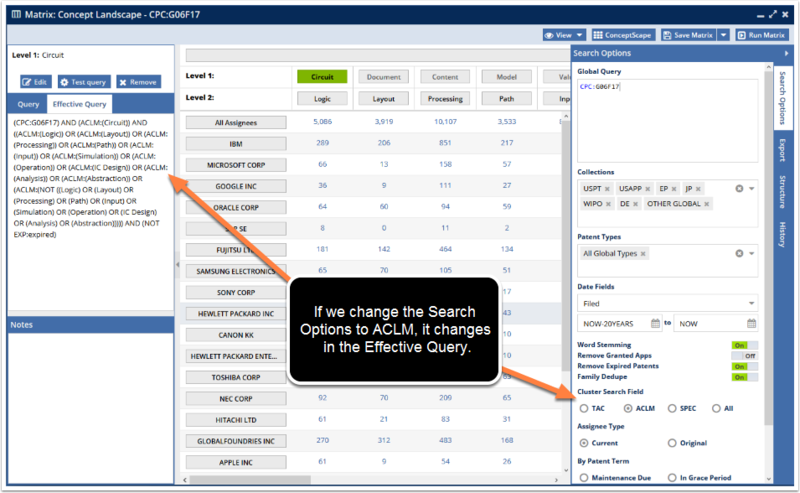 The Effective Query is now searching the ACLM field instead of the TTL field (note that although it's changed immediately in the system, you will only see the Effective Query field change once you refresh it. This can be done by clicking a different term besides Circuit and then clicking back to Circuit, or by running the matrix). You can do this for any of the search options in the panel. It is important to note that changing the search options in the Search Options panel doesn't only change that one term's search query. Instead, it changes the search as a whole in the system created matrix. At this point in creating your matrix, there is no way to edit just the query for that one particular term. Now that you have an understanding of how the matrix is determined, and what you can change from the original matrix, here is a way to adjust the queries in the matrix to fit your needs. Ultimately, you are using the same steps as you would if you built the matrix from scratch, but the system has already placed some options there for you to build off of. On the far right of the rows, you will find an empty field with a plus ( + ) sign next to it. Here, you can add a new column. It is probably a good idea to name it based on the search terms you will use. A friendly term will be much easier on you in the future. Note that it can be the same name as one of the existing columns. This is helpful if you are looking to keep an existing column with a few adjustments. Once you have added it by clicking the plus, you can then drag the column to where you want it to be. When you first add a column, the Query field will be empty. You can add and edit it as needed by clicking directly into the Query field. If you want to change just the name of the column, you can click the Edit button above the Query field. This edit will not affect the query, itself. Just the Level title. If you want to delete a column or row entirely, highlight the column or row (here the column "Circuit (Added By Me)" is highlighted) and then click the Remove button above the Query field. These buttons work for both the terms you've added and the terms that were created by the system. Notice in the example above that I put "TTL:circuit" into the Query field. In Search Options, ACLM is checked. 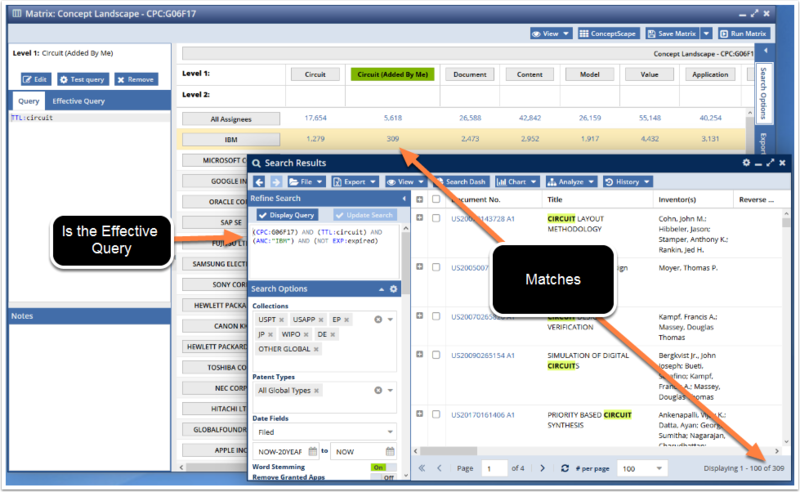 This will affect the system generated term queries, but will not affect the term queries for the columns that you add. 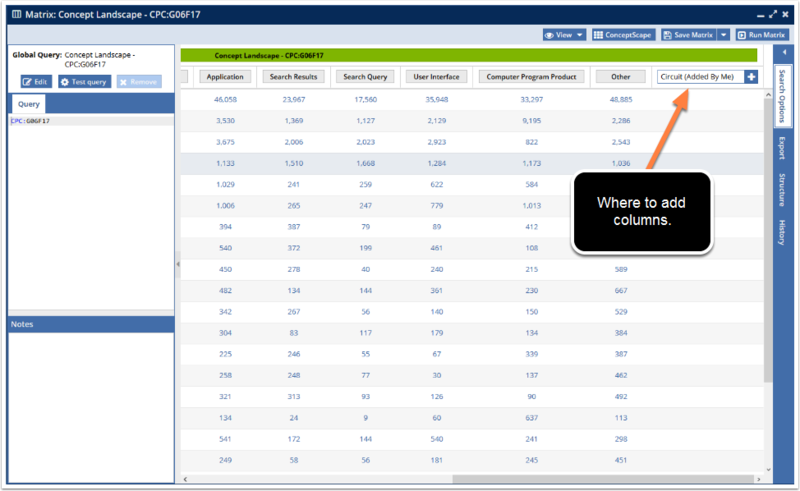 However, other changes in the Search Options panel will affect the Effective Query for the columns that you add. So if you turn Remove Expired Patents off, the "AND (NOT EXP:expired)" portion of the Effective Query will disappear for all of the queries. TIP: When you are creating your own terms and Query fields, a good idea is to click the Test Query button. If there is something wrong with the query terms you are using, the notes panel will turn pink and tell you there's an error. Testing your query is a good habit to get into, because if you have an error in one query and run the entire matrix, all of the fields will be blank. If you forget, though, the Search Options panel on the right will have an Error section that will help. 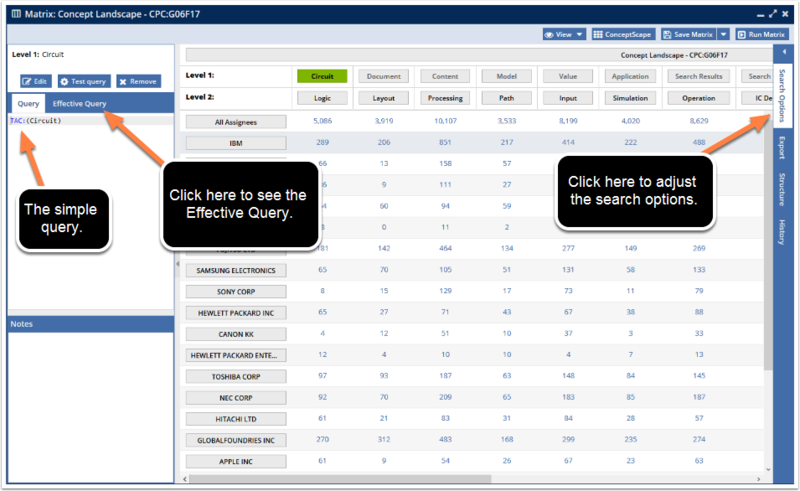 Once you've run the matrix, you can click on the number of patents in any of the fields to pull up a Search Results grid window with just those patents listed. You may decide that you want to build a matrix from the ground up, and not have the system build you one. If you have a particular landscape in mind that is too varied to pull up using a single search (e.g., you want the top assignees patent portfolios in a single CPC code, but you also want a column listing those top assignees entire patent portfolio), it might be a good idea to build a matrix from scratch. To do this, click the Matrix Manager button on the AcclaimIP desktop. In the Matrix Manager, click the New button. The Matrix Manager button (1) will pull up the Matrix Manager window. Click on New (2) to create a matrix from scratch. The matrices (3) listed in the My Matrix Queries are those matricies that you have created. This includes both those that the system created and those that you created from scratch. If you want to see matricies that have been shared with you by another AcclaimIP user, click on the Shared Matrix Queries tab (4). Once you've clicked on the New button, the Create New Matrix window will pop up. Here, you can name the matrix and all of the level rows, up to a maximum of 4 levels. Note that you have to have something in every name field in the Create New Matrix window in order to click the Create button. You do not have to use the default names in the Levels, but even if you decide that the Heirarchy Depth will be less than 4, you still have to have a name in every label field. If you want to apply the search preferences you have set in your Preferences (e.g., Word Stemming, Remove Granted Apps, a date range, etc. ), click the "Apply Preferences" radio button. If you would rather have the default system settings, leave the Apply Preferences box unchecked. Once you have the names the way you want them, you can click Create. The system will then create a matrix with nothing in the rows or columns. You will then add them exactly as you did for the matrix that the system created, using the empty fields with the plus ( + ) sign after them. Note: Your global level can be whatever you want it to be, but you may find that it is often a good idea to use *:* (asterisk colon asterisk) as the Query in the global level. 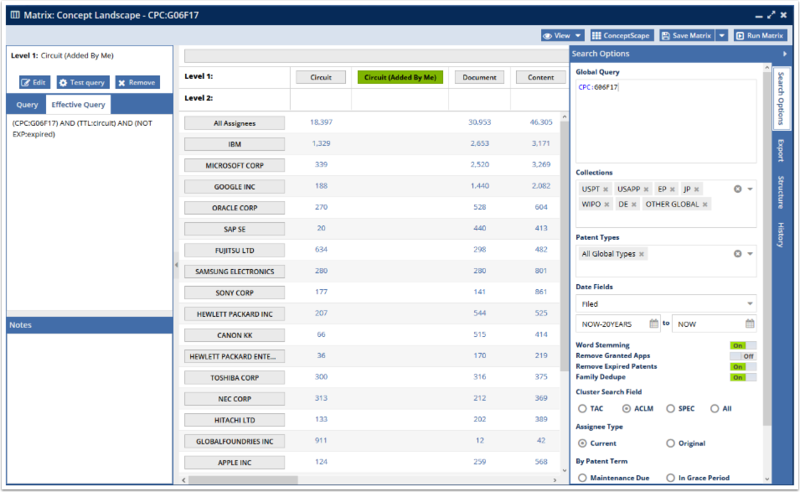 This tells the system that you want to query the entire corpus of patents in the collections you have chosen. 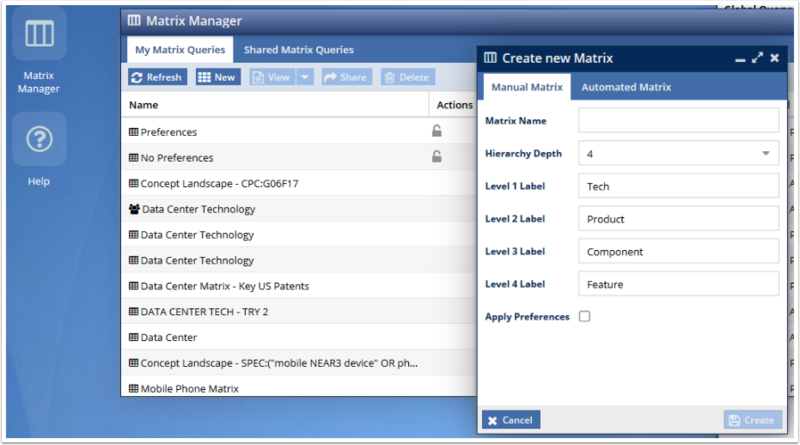 By using the *:*, you are allowing yourself greater flexibility when you are creating your matrix term search queries. If you were going to restrict the matrix to, say, one CPC code or one assignee, you might be better served by using a system created matrix. Searching the entire corpus allows you do create basically any patent landscape you might need, no matter how strange and varied it may be. Often, consumers of large amounts of data find that results presented in certain forms are easier to digest than other forms. This is where the Conceptscape in AcclaimIP comes in. The information in the Conceptscape is pulled directly from the Concept Landscape Matrix that you built, either through the system or from scratch. 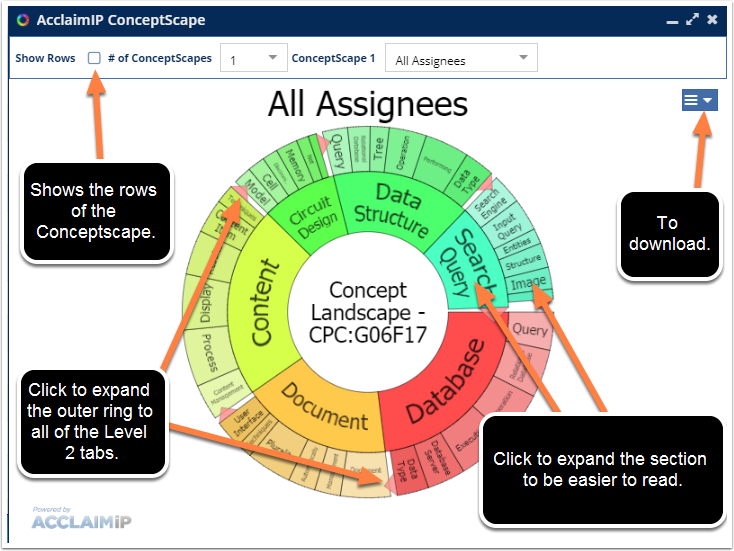 The Conceptscape is a way to present the same information in a different format. Just like you can present a chart as a line graph, a bar graph, or a pie chart, so, too, can you present Matrix information in the Concept Landscape Matrix or in the Conceptscape format. 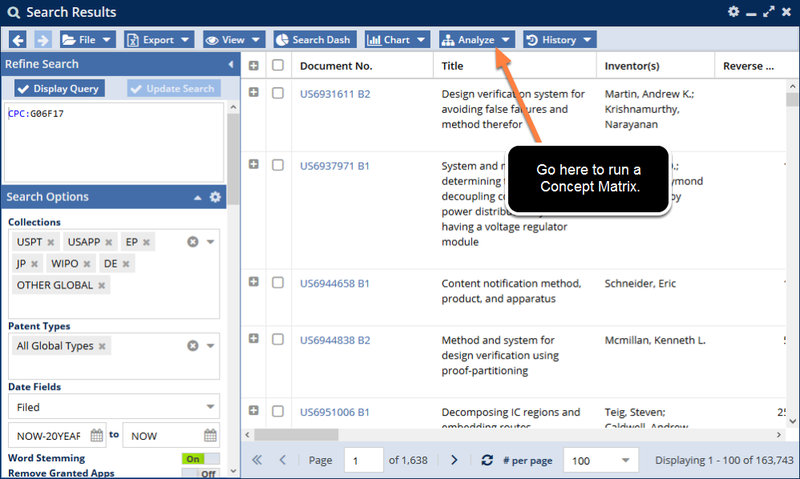 In order to run the Conceptscape, either click Conceptscape in the top right corner of your matrix, or click Analyze>Conceptscape in the Search Results grid. 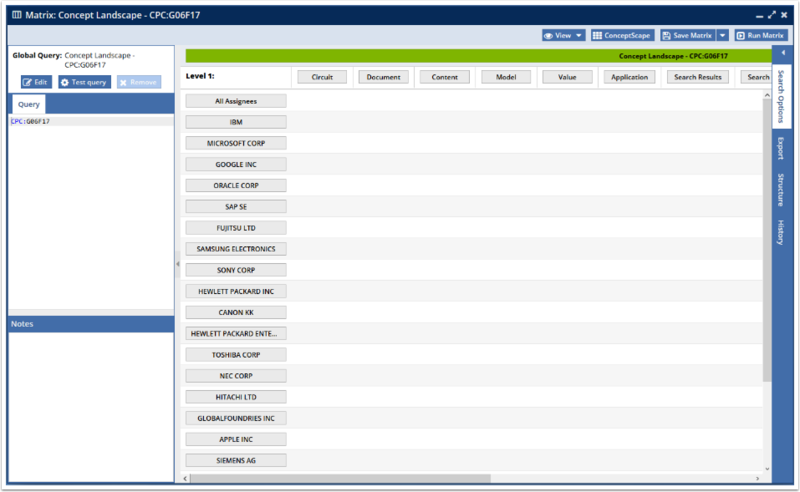 If you choose to run the Conceptscape from the Search Results grid, you will not have to run the matrix first. The system will automatically run the matrix and then pull the information from the matrix into the Conceptscape. The system will not, however, automatically save the matrix. It is up to you to remember to save the matrix, if you so choose. To make the different levels easier to read, you can click on any section you want to expand. When you are done, just click on it again and the section will shrink back to its original size. You can also click on another section and that section will then expand out, causing the previously opened section to shrink back to its original size. On a Windows machine, if you Ctrl+click on any of the pieces of the pie, you can pull up a Search Results grid window with just the patents in that particular section. This is just like if you clicked on one of the blue numbers in the matrix itself. Additionally, you can use the top tool bar to create more than one Conceptscape in the same window, or change the assignees from All Assignees to a specific assignee in the set. This is very useful if you want to compare different data sets (e.g., two different assignees) in the Conceptscape.